Pablo Casals was actually named Pau Casals and was born in El Vendrell, Catalonia, Spain. His father, was a parish organist, choirmaster and strict disciplinarian and he became Casals' first teacher in piano, song, violin, and organ. At age four Casals could play the violin, piano and flute and at the age of six he performed his first violin solo in public. He first encountered a cello-like instrument from a local traveling Catalan musician, who played a cello-strung broom handle. Upon request, his father built him a crude cello, using a gourd as a sound-box. When Casals was eleven, he heard a real cello performed by a group of traveling musicians, and his passion and dedication to teh instrument was ignited. In 1888 his mother, took him to Barcelona, where he enrolled in the Escola Municipal de Música. There he studied cello, theory, and piano. At thirteen, he discovered, in a second-hand music store in Barcelona, a tattered copy of Bach's six cello suites. He spent the next 13 years practicing them every day before he would perform them in public for the first time.He is perhaps best remembered for the recordings of the Bach Cello Suites he made from 1936 to 1939. One day a Spanish composer Isaac Albéniz heard him playing in a trio in a café and gave him a letter of introduction to the private secretary of María Cristina, the Queen Regent. 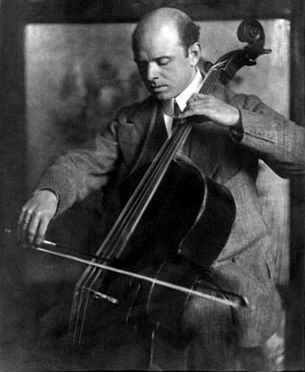 Casals played many informal concerts in the palace, and was granted a royal stipend to study composition at the Conservatorio de Música y Declamación in Madrid. After Madrid he had a short engagement in Paris as second cello in a theater orchestra and returned to Catalonia as part of the faculty of the Escola Municipal de Música in Barcelona. From 1899 he began touring and played in England for Queen Victoria, Spain, France, Netherlands, South America and United States, to great public and critical acclaim. In 1911 he played Brahms's Double Concerto for Violin and Cello with Fritz Kreisler. Back in Paris, Casals organized a trio with the pianist Alfred Cortot and the violinist Jacques Thibaud; they played concerts and made recordings until 1937. In 1936, the Spanish Civil War began and Casals was exiled from Spain following the defeat of the Spainsh Republican government. He vowed not to return to Spain until democracy was restored. He settled in the French village of Prada de Conflent, on the Spanish frontier and during WWII he made sporadic appearances as a cellist in the unoccupied zone of southern France and in Switzerland. He fiercely opposed the dictatorial regime of Francisco Franco and refused to appear in countries that recognized the authoritarian Spanish government. After marrying his third wife in 1957, 20-year-old Marta Montañez y Martinez from Puerto Rico, he resided in the town of Ceiba making an impact in the Puerto Rican music scene, by founding the Puerto Rico Symphony Orchestra in 1958, and the Conservatory of Music of Puerto Rico in 1959. As a composer Casals created various peices his most famous being La Sardana, for an ensemble of cellos and El Pesebre that he presented to the United Nations during their anniversary in 1963. One of his last compositions was the "Hymn of the United Nations". He conducted its first performance in a special concert at the United Nations on October 24, 1971, two months before his 95th birthday. On that day, he was awarded the U.N. Peace Medal in recognition of his stance for peace, justice and freedom. During his lifetime he received many awards some of the most notable being the Order of Carlos III from the Queen Regent (1897), U.S. Presidential Medal of Freedom (1963), Charles E. Lutton Man of Music Award in 1973. 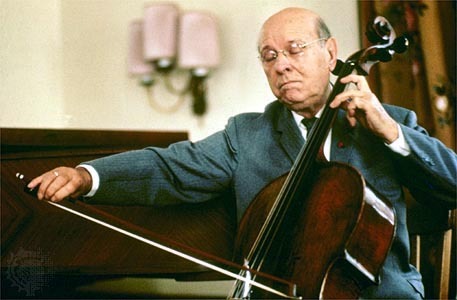 Casals died in 1973 in San Juan, Puerto Rico, at the age of 96 and was buried at the Puerto Rico National Cemetery. He did not live to see the end of the Franco dictatorial regime, In 1979 his remains were laid to rest in his hometown of El Vendrell, Catalonia. Among some people it is thought of as the best cello ever made.